Most situational judgment tests are not timed. In a typical situational judgment test question, you are given a short work scenario and several possible responses or actions to take. 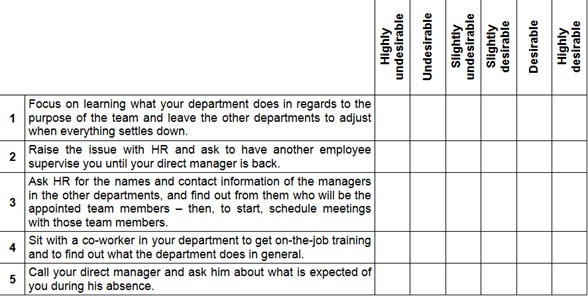 Your task is to rate each possible response or action on a scale from strongly undesirable to strongly desirable based on its effectiveness to resolve the work problem introduced in the scenario. You are a new employee at a big firm. Your job, as had been described to you, is to lead an interdisciplinary team with members from various departments with whom you will need to work closely. Coincidently, you have started the job at the busiest time of the year, so it has not been explained, nor have you been directed, as to exactly what is expected of you and who are to be your co-workers. Your direct manager is on sick leave and soon to go on a long vacation. You feel very uncomfortable and unsure of what is expected of you in the upcoming weeks. As this is a question that doesn’t have a right or wrong answer, we will explain what an employer might learn from your response style. The focus will be on what a ‘highly desirable’ response implies, assuming that the opposite will be implied when selecting ‘highly undesirable’. When selecting option 1 as ‘highly desirable’, you are suggesting that you are likely to focus on what is close at hand and not take the initiative to explore wider issues. Selecting option 2 as ‘highly desirable’ suggests that you are aware of the problematic nature of the situation you are in, but are unwilling to solve it on your own – you expect others to come up with that plan. By selecting option 3 as ‘highly desirable’, you demonstrate that you are likely to take a straightforward approach to address the uncertainty of the situation and know how to recruit others to assist you without depending on them to come up with the solution. Choosing option 4 as ‘highly desirable’ indicates that you have not acknowledged the problematic nature of the situation and may get completely lost in an uncertain situation. It shows you might not take the initiative or know how to differentiate the main aspects of your work. If you picked option 5 as ‘highly desirable’, it suggests that you are likely to acknowledge the problematic nature of the situation, but are unable to solve it on your own.